Pyori is a small command-line tool I wrote to merge multiple “todo” lists into a single list. It is probably one of those things that is only really useful to me, but I thought I’d open-source it in case someone else has similar needs. regularly pursues more than one work or personal goal over a given time period. has “todo” lists for each goal. prefers to work sequentially, one task at a time (as opposed to multi-tasking). wants to avoid the decision fatigue resulting from constantly needing to prioritize limited time between several goals. Still interested? Find instructions for installing Pyori here. Now, an example. Let’s say you’re currently working on two projects: a research paper and a calculator app. First step is to list out the “todo” lists – or task lists – for each goal. Give each task a number approximating the level of effort required to complete it. You can also choose to associate descriptive information with a goal via a YAML file of the same name. These files are optional, but improve the readability of Pyori’s output. They can also be used to control some of Pyori’s additional features (for example, listing dependencies between goals). You can now open up this list as a spreadsheet, manually format rows if desired, then print off. The point is that now you have a single “todo” list that will help you manage your time between two goals. Of course, this concept can be extended to any number of goals. One thing to note is that the tasks have been randomly merged in such a way that tries to maintain a fairly even distribution of high- and low-effort tasks. 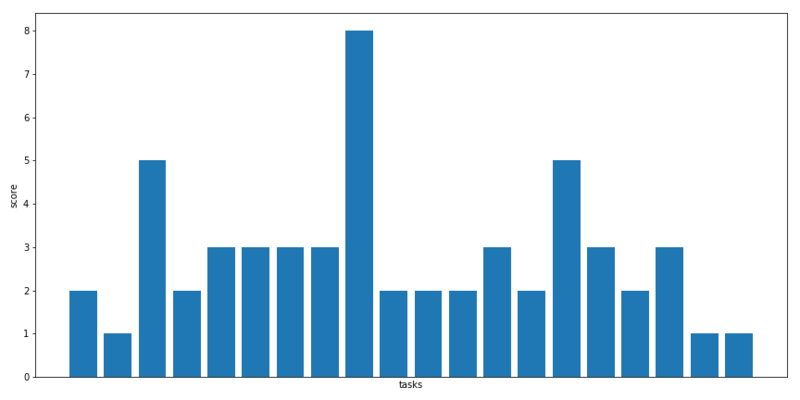 Look below to see a bar chart showing the score (effort level) of each task in the merged list. Notice how the high-effort tasks are fairly well mixed in among the low-effort tasks. That concludes my short introduction to Pyori. If you find this tool useful or if you have thoughts about ways to make it better, please let me know!